Tim & Linda Dobson In 1995 I received a phone call from Dwayne McClure. Dwayne (also known as Mac) was the owner of McClure Sewing Machine Service and an old friend. In response to his call I went over to visit Dwayne and Shirley. First we enjoyed Shirley's homemade cookies and coffee. Then Dwayne said, "Tim, I'm going to teach you how to repair sewing machines and then I am going to give you this business." At the time I was not aware that I wanted to learn about sewing machines, but Mac was persuasive. That generous decision by a good friend was the beginning of what would eventually become The Sewing House. For several years my wife, Linda, and I operated Dobson Sewing Machine Service out of our home. I serviced thousands of sewing machines. Linda did the bookkeeping. I began to notice how New Home Sewing Machines were solidly built. They reminded me of the old black sewing machine my mom used when I was a boy. I learned that New Home Sewing Machines were manufactured by the Janome Company. I gradually decided that if I ever became a sewing machine dealer I would sell the Janome brand. In 2007 Linda and I formed The Sewing House, LLC, and became an authorized Janome dealer. We rented a small retail space at Quincy Place Mall in Ottumwa. We also purchased an old house located at 255 N. Davis Street. We began remodeling it into a sewing store. Our intentions were to sell and service sewing machines. Often the ladies who came to the store asked when I was going to start selling fabric. Finally I decided to buy a few bolts. We started out with one little rack of fabric in the backroom. Our customers encouraged us to buy more. Gradually we increased our investment in quilting fabric. Soon the walls of The Sewing House were lined with more than 2000 bolts of beautiful fabric. We soon outgrew our original Sewing House on Davis Street. We were actively looking for a larger property. One day in 2011 a good friend of the store told me that Brown's Shoe Store was for sale. We contacted the owner and after a short negotiation we purchased the building. After extensive remodeling we moved into our new Sewing House at 220 East Main in 2012. We now have about 6000 square feet of display and class room areas. When you come to The Sewing House you will see over 6000 bolts of fabric, sewing supplies, quilting tools, a classroom, Janome, Elna and Necchi sewing machines, embroidery machines and sergers. We service the sewing machines we sell and we service all makes and models of home sewing machines sold by others as well. We have added Riccar vacuums from St. James, Missouri and Sebo vacuums from Germany. Our name has been changed to The Sewing House & Main Street Vacuum. We service the vacuums we sell and we service all makes and models of vacuums sold by others as well. We keep bags and belts in stock for most vacuum brands. Some of our customers have joined our team. They make The Sewing House a relaxing, refreshing destination for visitors from all over southeast Iowa and northeast Missouri. We hope you will stop by soon. You will always be welcome. 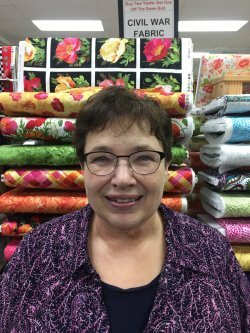 Bobbi comes to us with over 30 years of quilting experience. 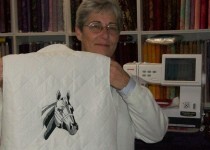 She has done long arm quilting for over 15 years. She worked at the Needle Nook Quilt Shop in Bloomfield for 6 years. In the 1960's she worked at Wintermotes Fabrics in Bloomfield for 4 years. She is a proud owner of a Janome MO200 sewing machine and a Janome 3160 sewing machine. She is a member and past president of both the Ottumwa Quilters Guild and The Threads of Friendship Quilt Guild in Bloomfield. Leta loves her Janome MC 15000 Sewing/Embroidery Machine and Digitizer MBX. She has owned most of the Janome embroidery machines available in the last 10 years. (Editor's Note: Leta is one of the most knowledgeable machine embroidery educators I have ever met.) She has teamed up with The Sewing House to provide tech support for our embroidery customers. Contact her by phone at 641-919-2340. She will answer your questions or set up a time to help you accomplish what you want to do with your Janome Embroidery Machine or software. Leta hosts embroidery club on the first Wednesday of each month from 10:30 AM to Noon. 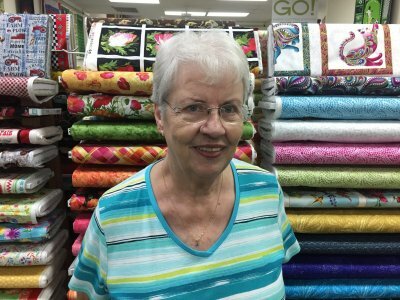 She hosts sewing club on the second Monday of each month from 10:30 AM to Noon. She often teaches classes during the afternoon of club dates. She posts her class information on our Facebook page. 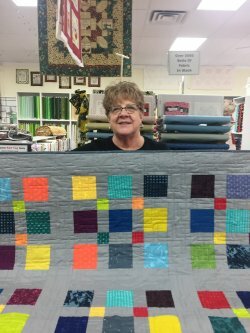 Tracey has been quilting for 15 years. She is past president & past vice-president of the Albia Crazy Quilters Guild. 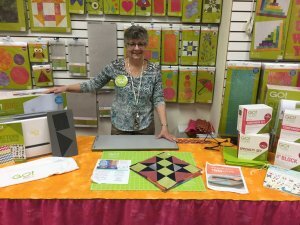 She teaches quilting classes and educates new sewing machine owners. She solves many problems over the phone for our sewing machine customers. She loves to teach and our customers know that. Tracey is the proud owner of a Janome Horizon Quilt Maker 15000, an 11000SE , an Elna eXcellence 780 and an Elna eXperience 680. Kris and her partner, Gay, owned the Patchwork Peddlers bus for several years. Then they owned the Patchwork Peddlers Quilt Shop for several more years. Now Kris works with The Sewing House. She does so much to make the store beautiful. She owns an Elna Excellence 780 sewing machine and a Janome Heart Truth sewing machine. She loves to do long arm quilting. Kathy Welsh from Albia has quilted for over 20 years. She comes to The Sewing House after retiring as Monroe County Public Health Administrator. She owned her own video and office supply business for 14 years. She loves helping retail customers. Trevor grew up in the vacuum industry. He was cleaning vacuums at his neighbor's vacuum store when he was 14. He managed an Oreck Factory Showroom in Denver, Colorado for 3 years. 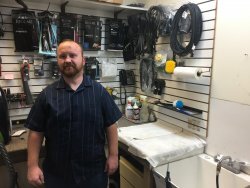 He managed a multi-line vacuum store in Ft Collins, Colorado for 5 years and owned it for 3 years. He moved back to Bloomfield, Iowa to be near family. Trevor loves to help folks with their vacuum needs.